How will my purchases be delivered? What are the delivery charges for my order and location? The availability of the products that you select is clearly displayed on the product page and on your order confirmation. However, this cannot be confirmed until your order has been processed, and you will receive an e-mail confirming your expected delivery time shortly after your “order confirmation”. On entering “Your Details”, if you have purchased multiple items, you can group them into separate deliveries so that they will be delivered individually as they become available or in however many deliveries you stipulate, at an additional cost. Otherwise, you will receive a single delivery once all of your items are in stock. For example, if you have ordered 3 items with varying lead times of 7 days, 2-4 weeks and 6-8 weeks, your expected delivery time will be 6-8 weeks, unless you select individual deliveries. We will contact you by telephone or e-mail when your goods are ready to deliver, in order to arrange a suitable delivery date for you. Please note we will always try to deliver on the next available delivery day to your area and are unable to hold your items in stock. Our delivery service covers the whole of the U.K., although the Scottish Highlands, Ireland and other islands off the mainland do have a more restricted service. Depending on the size and weight of your goods, they will either be delivered by courier or by a 2 man delivery team. In some circumstances, there will be products we will be unable to deliver outside of the UK. Please see section ‘What are the delivery charges for my order and location’ for more details. For small accessories we use a courier service to deliver your order. They will contact you directly to inform you of the delivery date and estimated timeslot for that day. For large accessories and furniture we will contact you by telephone or e-mail when your goods have arrived at our warehouse in order to arrange a suitable delivery date for you. As explained in ‘When will my purchases be delivered?’ you can stipulate whether you want to receive split deliveries, as products come into stock, or a single delivery once everything is available. If you are located outside of a 40mile radius from our Oldbury or Manchester warehouse we use a specialist furniture courier who will contact you directly to schedule a suitable delivery date for you. On the day of delivery, you will be contacted first thing by the delivery drivers to advise you of your timeslot for the day. They can, if you wish, also give you notice, by whatever time period you request, just before they arrive. It is your responsibility to ensure clear and sufficient access to the room to which you would like your new furniture positioning. On all local deliveries within a 40mile radius we will position your furniture in the room of your choice, remove all packaging and carry out minor assembly. We'll then bring back all of the packaging to our warehouse for recycling. Each delivery is chargeable dependent on the location of your delivery address and will be calculated accordingly at the checkout. Any postcodes that fall outside of the UK mainland* have a more restricted service, and will incur an increased charge as the order will be sent via an outside delivery service. Delivery to postcodes outside of the UK mainland will also depend on the size and weight of your product. 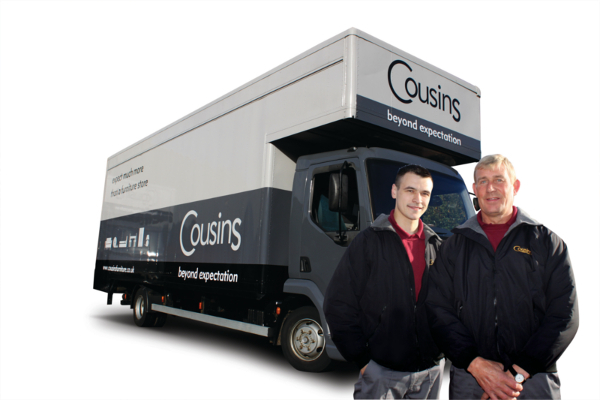 For more information about these delivery charges for your order and location, please contact us directly via email at online@cousinsfurniture.co.uk. We charge on a per delivery basis, so if you order a picture plus a 3 piece suite, the mainland cost will be £49.95. Unfortunately, we are unable to take your old furniture away, preferring not to handle new furniture with old. However, if you are having difficulties disposing of it, your local council will be able to assist you. In the areas local to our stores, we use registered charities who would willingly collect your furniture, as long as it is reusable, for a worthy cause. If you need details, please contact us by email. We do not normally perform part deliveries, unless this is requested. It is normal procedure for us to deliver all of your items together once they are all in stock. However, if you have ordered multiple items, you can choose to have them delivered individually once they become available but will be charged on a per delivery basis. How does your Returns Policy work? If your products are found to be defective or damaged in any way at the time of delivery, it should be reported to our delivery team who will then communicate the details to our Customer Services Department. If a defect is discovered after delivery, you must contact us within 30 days of the delivery or, in the event of a latent defect, within 30 days of the date upon which it is discovered. As you would expect, we have a full-time, professional Customer Services team, including skilled upholsterers and french polishers, fully equipped to effectively resolve any service requests you may have. Upon receiving a service request, we will arrange to inspect the product concerned. Please do not make any use of it, or make any other arrangement until we have been given the opportunity to inspect and investigate. If, upon inspection, we agree that the item is defective and we are unable to repair the item to manufacturing standards, we will arrange for the exchange and collection of the item for a replacement. Please note that once unwrapped, beds/divans and mattresses are excluded from our Returns Policy for health and hygiene reasons. Self-assembly and flat pack furniture cannot be accepted for return once partially assembled, unless the product is proved to be defective. Office Hours: Monday – Friday 9 a.m. – 5 p.m.